Theresa May says the government will be "robust" in its response to a House of Lords defeat which potentially gives Parliament a decisive say on Brexit. No 10 said the cabinet had "strong disappointment" with the vote, adding: "We wish for the bill to go through in the same way it left the Commons." Some ministers accuse peers of trying to "thwart the will of the people". But Labour leader Jeremy Corbyn said: "Parliament must be sovereign on this matter and make the final decision." He said the vote marked a "hugely significant moment" in the fight to ensure Parliament has a "proper role" in the Brexit negotiations and a no-deal situation was avoided. On Wednesday the key Brexit sub-committee of senior ministers will meet, with the issue of the UK and EU's future customs relationship expected to be on the agenda. Speaking to a House of Lords committee on Tuesday, Brexit Secretary David Davis said the EU had "pushed back" against the UK's two proposals aimed at avoiding a hard border in Northern Ireland. He said Brussels was concerned by the prospect of "porosity" on the EU's external border and by the risk of creating a precedent which might be copied elsewhere. The amendment to the EU Withdrawal Bill - which would give MPs the power to stop the UK from leaving the EU without a deal, or make Theresa May return to the negotiating table - was approved by 335 votes to 244 on Monday night in the House of Lords. After the cabinet meeting on Tuesday, the PM's official spokesman said the Lords amendment risked tying the government's hands in negotiations with the EU. The government will try to persuade MPs to overturn the change when the bill returns to the Commons later this month. It was one of three government defeats on the Brexit bill in one day - bringing the total number of government defeats on the EU bill to nine. It is not yet known whether any of the amendments from the Lords will be accepted by the government. International Trade Secretary Liam Fox, a leading voice in the 2016 campaign to get Britain out of the EU, told BBC Radio 4's Today: "It is not acceptable for an unelected house to try to block the democratic will of the British people." He said allowing Parliament to send the prime minister back to Brussels if MPs and peers did not like the deal the government had secured with the EU opened up the possibility of "delaying exit from the EU indefinitely". And the option of "leaving the EU without an agreement" had to be kept on the table. He said there was a "big debate" to be had about whether an "unelected House" could "thwart the view of the British electorate". And he categorically ruled out the UK being in some form of customs union with the EU after Brexit, amid speculation the government could be lining up a "customs partnership" or an EU association deal. "No, I don't think we can stay in the customs union for a number of reasons, the main reason being that we would be in a worse position than we are today," he told BBC Radio 4's Today programme. "If we were in a customs union with the European Union we would have to accept what the EU negotiated in terms of market access to the UK without the UK having a voice." He added: "I don't think there is a customs union that could ever be acceptable." The UK is due to leave the European Union on 29 March 2019, with plans for a transition phase until the new permanent relationship kicks in after 31 December 2020. Both sides hope to negotiate the UK's withdrawal agreement by this October in order to give the UK and European Parliaments enough time to debate and vote on it before the moment of departure. The amendment proposed by Conservative Viscount Hailsham would allow Parliament to determine the government's course of action if MPs rejected the deal or if the UK and EU were not able to reach an agreement of any kind. 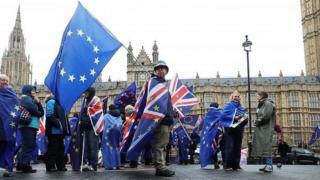 It would also give Parliament control of the process if the legislation enshrining the withdrawal treaty promised by ministers was not approved by 29 March 2019. The peer, who as Douglas Hogg was an MP for many years, told the House of Lords the principle of parliamentary sovereignty was "fundamental to our liberties and must not be betrayed" when it came to Brexit. "Whatever our party affiliation, our duty as parliamentarians is to our country and our conscience," he said. But former Conservative leader Lord Howard said the idea of effectively giving Parliament a veto over Brexit "reveals the appalling lengths to which the die-hard Remainers are prepared to go to achieve their aims". He told the BBC's Daily Politics that peers were "playing with fire".